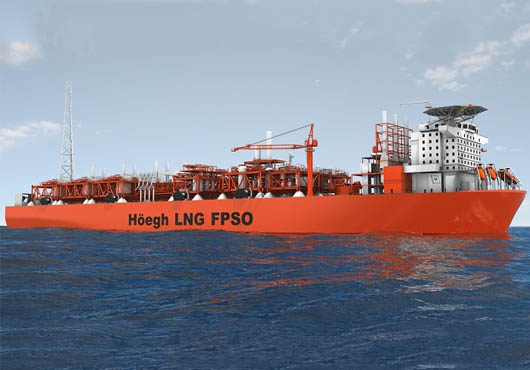 Höegh LNG Holdings Ltd. has entered into an agreement with South Korea’s Daewoo Shipbuilding & Marine Engineering Co. (“DSME”) to start a project specific front-end engineering design (FEED) of an LNG FPSO solution for the Tamar gas field offshore Israel. This agreement follows the recent announcement of the agreement between DSME consortium, DSME and its Norwegian joint venture D&H Solutions AS and Tamar field owners, Noble Energy, Delek and Isramco to exploit part of the Tamar field by use of an LNG FPSO. The agreement states that Höegh LNG with selected partners shall be the owner and operator of the LNG FPSO and that DSME shall be the EPCIC contractor, subject to further engineering work and a final investment decision. Tamar gas field is located some 80 km west of Haifa in waters 5,500 feet (1,700 m) deep. The gross resource estimate of Tamar has been increased to 9 Tcf from 8.4 Tcf as a result of appraisal work, Noble Energy said recently in a press release.